Last night there was a total eclipse of the Blood Moon. 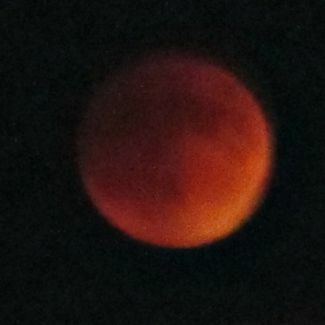 It was pretty spectacular, and the Blood Moon Eclipse got me thinking. I've posted a recipe for Full Moon Brownies, but what about Beet Brownies? Many chocolate cakes such as Red Velvet Cakes can be made with beets. So in honor of the Blood Moon Eclipse, here's a great recipe for Blood Moon Eclipse Brownies. Put beets in saucepan and add water to cover by ½ inch. Set over medium heat and bring to boil. Reduce heat and simmer 25-35 minutes, until tender. Drain and transfer to ice bath until cool. Transfer cool beets to food processor and pulse until minced. Line 9-inch by 9-inch brownie pan with parchment paper; lightly coat with butter. Cut sticks of butter into chunks and put in heavy saucepan. Add chopped chocolate and cook over simmering water, stirring constantly until chocolate begins to melt. Remove pan from heat and stir until smooth. Set aside to cool. In bowl of stand mixer with whisk attachment, gently mix eggs for about 30 seconds. Add vanilla and brown sugar; mix on medium-high until light and airy, about 2 minutes. Reduce speed and add minced beets then slowly add chocolate mixture and mix just until combined. Slowly add flour mixture and amix just until combined. Pour batter into prepared pan and smooth top with rubber spatula. Bake 30-35 minutes, until toothpick inserted into the center comes out clean. Cool brownies in pan for 5-10 minutes then transfer to cooling rack.